238 pages | 25 B/W Illus. 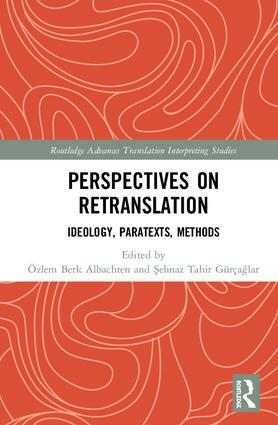 Perspectives on Retranslation: Ideology, Paratexts, Methods explores retranslation from a variety of aspects and reflects methodological and theoretical developments in the field. Featuring eleven chapters, each offering a unique approach, the book presents a well-rounded analysis of contemporary issues in retranslation. It brings together case studies and examples from a range of contexts including France, the UK, Spain, the US, Brazil, Greece, Poland, modern Turkey, and the Ottoman Empire. The chapters highlight a diversity of cultural settings and illustrate the assumptions and epistemologies underlying the manifestations of retranslation in various cultures and time periods. The book expressly challenges a Eurocentric view and treats retranslation in all of its complexity by using a variety of methods, including quantitative and statistical analysis, bibliographical studies, reception analysis, film analysis, and musicological, paratextual, textual, and norm analysis. The chapters further show the dominant effect of ideology on macro and micro translation decisions, which comes into sharp relief in the specific context of retranslation. 8.Translation Modalities Method in Retranslation Analysis: A Paixão Segundo G. H. in English. Özlem Berk Albachten is professor of Translation Studies at Bogaziçi University, Istanbul. She has published widely on Turkish translation history and is the author of Translation and Westernization in Turkey: from the 1840s to the 1980s (2004) and Kuramlar Isiginda Açiklamali Çeviribilim Terimcesi (2005 - Translation Terminology in Light of Theories). S¸ehnaz Tahir Gu¨rc¸ag?lar is professor of translation studies and teaches at the graduate programs at Glendon College, York University and Bogaziçi University in Istanbul. Her main fields of interest are translation history, ideology and translation and periodical studies. She is the author of The Politics and Poetics of Translation in Turkey, 1923-1960 (2008).